Meet Alejandra Paz & Holland Bowen Evans IV. But that's the thing, they are all the glam of cosmopolitan, international travelers and all the warmth of small-town, humble-at-hearts. You can just call them Ale (pronounced Al-lee) and Bo. 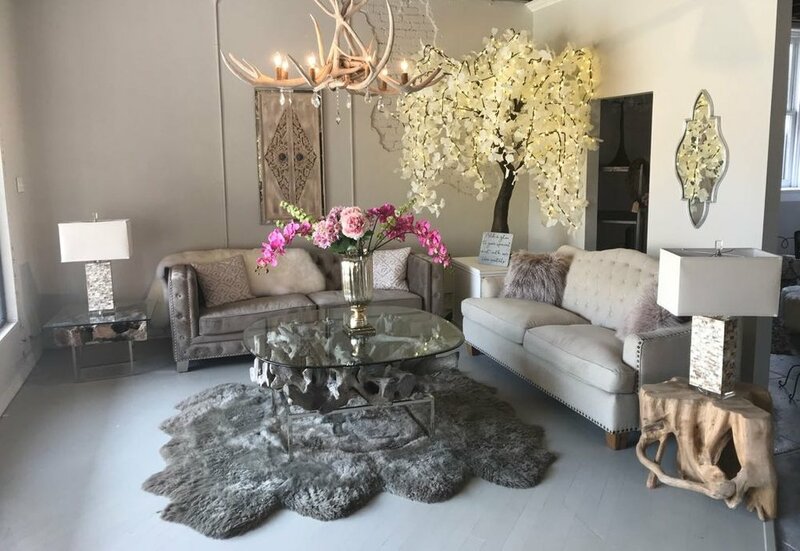 These visioneers are the hearts aglow behind Interior Glow, Waco's distinctly different home furniture and decor store. We sat down with the super-kind couple to hear about the shop's brand new location: 210 S. 5th Street (next to the Dr. Pepper Museum). Affectionately nicknamed, "The 210 Building" during the long journey of...well, read on and you'll see. We can't wait for you to get to it. What were you two doing before Interior Glow? Ale: Bo and I worked for the family business in Houston. When his parents sold the business to a big corporation, I stopped working for a bit so I could have our third baby! Bo: During that time, Ale got interested in real estate and we started flipping houses in the Houston area. We realized that Ale had a talent for home renovation and a giftedness for home staging. Ale: Honestly, I fell in love with making something that was ugly and undesirable – unloved – into something beautiful again. A place people want to live in, raise their kids in… I really enjoyed that aspect of that work. It's cool - ever since Bo and I got married, we’ve been working together. We’re the type of couple who enjoy it. We don’t get upset...(she laughs). It’s good. Ale: We met in a bar in Houston. (Her tone changes to super dreamy.) I went there with my cousin; Bo was there with his friend. It was his friends’ birthday. He was looking over at me for a while, and at the verrrrry end of the night he finally approached me and asked for my number. How has the new family business Of Interior Glow been for you both? Ale: I’ve loved it. When we were flipping houses – we kind of missed working with the broader family. We wanted to do something like that again. Bo: We started studying retail, took some online classes. We were actually planning on opening our store in Houston but had been coming to Waco for a very long time. It’s always kind of been a second home to us. My folks retired here; Ale has family here. My brother went to Baylor. We’ve been coming and going from Waco. We really fell in love with downtown, especially. Ale: A long time ago! When it was empty! You know, just the architecture, the river running right next to it. I always thought it had so much potential; how cool would it be for this place to be more than it was back then!? Bo: So we started weighing the pros and the cons of starting the store in Waco or starting a store in Houston. We noticed this: Ale's classy and natural style was nowhere to be found in Waco. We saw that her look could blend with other people's homes – it can blend with farmhouse, can blend with anything – we had something to offer the city. Ale: I just call it ‘Inspired by nature’ because I don’t think it fits into any particular style, but I love nature and I think God is the best interior designer ever. Bo: We have so many one-of-a-kind products that no one else will eeeever have except the person who purchases it. It’s so cool – we can buy something in the middle of a country field in the middle of nowhere - from an artisan and we deliver it to someone’s home, knowing the whole process and story! Most of the time, it’s not like we sat on a computer and ordered from China and 50 of them showed up and we sold them off. I think that's really a distinction between our store and other bigger stores, even some smaller ones – we buy in very little quantities. So once you see it, you may never see it again. We thought it'd be special to offer Wacoans items that no one else has. and bo, you love hearing the stories behind the items? Bo: Everybody likes walking through their house and telling the stories of the things around you. “This was carved by a shoeless Indonesian guy...” It’s fun. It’s fun to have those conversation pieces in your home. We enjoy buying those one-of-a-kind conversation pieces. Ale: (She's makin' a statement here.) We appreciate artisans. We view their pieces as, "Wow. This person took all this time to make this." They’re giving us a piece of what they are REALLY passionate about. Marsha Wilson, very talented, she does beautiful, wood burning. Pat Combs has this great vision for restoration. He’ll find this piece of wood left on the side of the highway and make a unbelievable table out of it. We sell Creative Waco's playing cards; each features a local art piece. Waco Coffee Candles started as a Baylor school project! He started making coffee candles. They smell great. It’s a coffee cup with a candle inside. He did really well but graduated so he’s selling his company to a local. We love supporting local artists. You'll see several local painters in the store, too. what was the "wow" story that landed YOu your building? Ale: In 2015, when we were really thinking Waco could be the place, we took a day trip. We called a commercial real estate guy to scout things out. The realtor was kind of taken aback when he heard what we were looking for downtown. A client of his, Tom Chase, had three buildings (Bo leans in: Those would be Barnett’s, Clay Pot, and a third building). Tom had been trying to find someone to buy them together for some time. But Tom made the decision that day to separate them. We went to see 210. Was absolutely perfect, built in 1913, the right price for us. We fell in love with it. Such a beautiful building. We put an offer in quickly. Bo: And the fact that Tom had decided to separate them that day - how many people – at least a dozen – had tried to buy the building before us, and he didn’t break them up. Ale: I was just like – thank you, God, for showing us the right thing to do. Bo: That process began in 2015. So this was before Magnolia Market, this was before all that, you know? Yeah! This happened before Magnolia was even opened. We didn’t even know that was going to be the case, when we were buying this building. Ale: For us, getting the building so easily was a sign. God telling us - I’m opening the door for you to do this in Waco. Where did the name your store come from? Ale: We wanted it to be special to us as a family. “Let your light shine” has always been our family verse. Matthew 5:16 talks about letting your light shine before others. We were trying to come up with a name - something to do with that. Trying to come up with a ‘let your light shine’ name, there were a million "let your light shine" churches. (She laughs.) Okay, can’t do that one. Bo: An interior glow is the same concept – of your soul and your home. An inner glow. Shine. Interior Glow is a perfect name for an interior decor, home, and gifts store. And it has that double meaning of what we were trying to express. Ale: We want to remind people - I always tell people in my little metal signs and things, it’s a reminder to let your light shine. you traveled the world for interior glow, right? Bo: It’s a big, legal process, unbinding three buildings together. In some cases there was plumbing running through one building to go to another, electrical running from over a roof to get to another...so it’s a long process to un-do the three buildings from each other. Ale: So, we went to furniture shows in Singapore, Hong Kong, and China and to the different furniture and home decor shows around the country. We began making purchases and started getting things in before we had a store! Bo: Thankfully, Tom Chase let us keep inventory at the building while we were going through the process; we were filling up the whole building before we owned it! Ale: This detail was kinda crazy: I always knew I wanted our store to be next to a coffee shop and I wanted to sell Summer Ellis Jewelry in our store - just had these ideas, you know? We met with Summer and Peter Ellis a year before we started. BRU wasn't even opened then. With our building in process, after we traveled, we decided to open up in the Praetorian and to use our building as a warehouse until it was ready. So ironic how that worked out. Summer Ellis Jewelry on one side; a coffee shop on the other. We opened Interior Glow there in 2016. It's been running for a few years now. Any favorite stories? Ale: You'll see a mother and daughter shopping together, and the daughter falls in love with the coffee table she would love to have. You see it unfold – the mom coming back and buying it for her daughter who can’t afford it. And we get to deliver those things, having watched those stories come to pass. Knowing, okay, I bought this coffee table for our store, because I thought it was beautiful, hoping someone else would be able to enjoy it. That is so rewarding. The first year we were opened, we wanted to give back to the community. We decided to give away one couch. We asked people to nominate someone who is a light in their community. It was overwhelming; how many people wrote letters and they were so touching, so amazing. It got to the point where we just could. not. give away just one couch so we ended up giving two couches and two love seats, and even that was hard because of the other stories we loved! We got to deliver them and meet everyone ...and most of the stories were like - I grew up with my grandma having the same couch; she raised me with five other kids… For me, that was one of the most touching moments we’ve had in our business. It just felt so good to give back. And they really needed this item. That, for us, was awesome. Bo: Our tree rentals always make memories, too. We’ve done sooo many weddings and parties, events all over central Texas. We have several different styles and sizes of these really beautiful LED trees. We’ve met so many wedding planners! What does it mean to you to be a business owner in Waco? Ale: Honestly, It’s been hard because we’ve never opened and operated a shop before. A lot of learning as you go. It’s important when you have a business to let people know you’re there. There’s a lot of tourism that comes to Waco and I appreciate it very much, but at the end of the day, we really need the locals to know about us. I’m also on the board of City Center Waco right now. It’s been such a fun experience to hear – they want to do this is in this area, and they want to do this in that other area, the city wants to fix the sidewalks... I'm so glad I agreed to it! Bo: Our competition in the furniture market has been established here for generations. Either they’re huge companies or they’ve been here for years. So that’s been challenging for us. Ale: Everybody says that the first two years are the toughest. It’s been sustaining itself and we’re blessed about that. We're asking, "How do we get the locals to get to know us?" What does it mean to do you when someone chooses to buy from your shop vs. going to Target or Wal-mart, buying online? Ale: It means so much. It’s hard for people who've never run a small business to understand how hard it can be. Especially since there are so many big companies out there, people can buy online so easily. When you see someone choosing local, it’s exciting. It feels really good to someone like us because we know locals have so many options! It says someone wants to have an experience, a different experience – they want to see unique things, experience something new: new styles, new looks, more unique items that they probably wouldn’t get online or from a big company. That’s local for you, right? I'll see this group of people – they wanted to have an experience, enjoy the day, and walk around. Now that we own a small business, I want to eat at the restaurants downtown, I want to go to the shops downtown, anything local! You see yourself choosing, supporting, local businesses. It’s a good community. Bo: Every day people come in that are local that say, "We didn't know your store existed." Crazy, in a city this size. The perception of downtown is that it’s packed with tourists. But actually, there’s public parking and the lots are always empty! There’s plenty of room. Tourism? Yes. But this is for you! It’s for locals to enjoy. Come! Experience downtown, the awesome new restaurants and shops. Some people try to stay away...it’s such an quality place and becoming better and better all the time. I think people would fall in love. When do you open in your new location? Ale: We're already opened! In the 210 S. 5th Street building. We opened the second week of May! We still want to do a grand re-opening party with live music and food so we can celebrate this moment. I want to get well-situated, bring in more new things. You're invited...visit the everyday elegance of Ale and Bo's collection at Interior Glow. Right now, grab the Towny app for FREE to find a bonus as you shop. Don't forget --> download Towny to keep it local, ya'll.